Prosecutors on Monday announced the indictment of eight alleged members of the “Orange County Mexican Mafia” involving a robbery that left a man dead and an attempted murder of one of their own in Placentia. Suspected gang leader Johnny Martinez, 42, was incarcerated in the Salinas Valley State Prison in Monterey County when he allegedly orchestrated the crimes in 2017. He was already in prison for murder and two counts of attempted murder, officials said. Martinez communicated with his No. 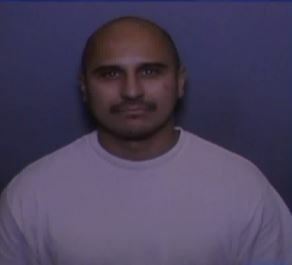 2 man, Gregory David Munoz, a 30-year-old inmate at the Calipatria State Prison in Imperial County, in connection with the murder of Robert Rios outside the victim’s Placentia home, according to the Orange County District Attorney’s Office. Munoz allegedly contacted three other accused gang members—Ysrael Jacob Cordova, 33, Ricardo Valenzuela, 38, and Augustine Velasquez, 22—to take money and drugs from Rios, according to officials. Munoz then directed a man named Charles Coghill to retrieve a Chrysler 300 and semiautomatic firearms in Santa Ana, drive to an Anaheim hotel and pick up Cordova, Valenzuela and Velasquez on Jan. 19, 2017, OCDA said. Cordova, Valenzuela and Velasquez then allegedly got out of the vehicle armed with the weapons, walked through Rios’ front gate and confronted the victim in the front yard. Cordova shot Rios in the chest and left leg before he and the two others fled, according to prosecutors. Emergency responders found the victim unresponsive outside the residence. He was later declared dead of a gunshot wound, OCDA said. Security cameras at the home captured the crime, the agency said. On or around July 28, 2017, Martinez allegedly directed Frank Mosqueda, 39, of writing a “kite” or message authorizing the murder of Munoz, his former top associate who had been released from prison. Martinez read a text message from Munoz saying he was at his girlfriend’s home in Placentia, according to OCDA. He then texted 30-year-old Omar Mejia, an inmate at Calipatria State Prison, to organize Munoz’s murder, the agency said. Mejia then allegedly asked Mosqueda, who was living in Huntington Beach, and Robert Martinez of Corona to commit the murder. That evening, the two met in Placentia and drove to Munoz’s location, OCDA said. Shortly after 11:11 p.m., the pair assaulted Munoz and two female victims outside a home in Placentia, according to prosecutors. Mosqueda allegedly shot Munoz eight times, hitting him seven times in the legs back and arm. He also aimed the gun in the foreheads of the the other victims, OCDA said. Munoz was taken to the hospital and survived his injuries, the agency added. Placentia police arrested Mosqueda at his parole office in Irvine on Aug 8, 2017. Robert Martinez had been in custody at Orange County Jail, according to OCDA. Johnny Martinez was charged with conspiracy to commit a crime, murder, first-degree residential burglary and street terrorism in Rios’ murder. If convicted as charged, he could face life in state prison without the possibility of parole. In the second incident, he was charged with attempted murder, conspiracy to commit murder, two counts of assault with a semiautomatic firearm and street terrorism. He could face 75 years to life in state prison if convicted of those charges. Charges against Munoz, Cordova, Valenzuela and Velasquez included conspiracy to commit a crime, murder, first-degree residential burglary and street terrorism. All of them could face life in state prison without the possibility of parole. Robert Martinez, Mejia, Mosqueda were charged with attempted murder, conspiracy to commit murder, two counts of of assault with a semiautomatic firearms and street terrorism. Robert Martinez and Mosqueda were also charged with one count each of being a felon in possession of a firearms. They could face 75 years to life in state prison. Coghill, the accused driver in the January 2017 murder, was charged in a separate case, according to OCDA. “Our recommendation to the [Department of Corrections] is that these people be put some place and watched in some manner so they can’t make these communications,” O.C. District Attorney Tony Rackauckas said. The Mexican Mafia became “much more active and violent” since Johnny Martinez took control of the Orange County Jails in 2016, according to the agency. “You can’t really predict who’s the next straw man to come along when one gets deposed,” Rackauckas said.